Indie developer Burst Online Entertainmen t has launched a Kickstarter project for Stone Wardens , its upcoming tower defense/RPG hybrid. Stone Wardens mixes tower defense mechanics with cooperative 4-player action and light role playing mechanics. Players choose one of at least four wardens, guardians from the game's bright, Pixar-influenced world, and use a combination of active skills, pet-like familiars and statues of ancient, ancestral guardians to defend against the game's Invader enemies. The game aims to merge tower defense mechanics with multiplayer action RPGs—think Orcs Must Die meets Diablo 3. 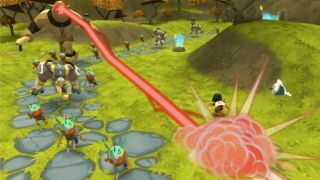 “We took the tower defense game, which we thought was fun, and added the moment-to-moment excitement of action RPGs,” says David Bowman, creative director at Burst. “Normally in these games you set up your towers and watch what happens. Now we've said, 'You're a character in the world, you have abilities, and you'll be using those abilities and managing what happens rather than sitting back and watching what happens. '” The project, on Kickstarter until August 1, is looking for $225,000 in funding. $20 gets you digital access to the game, which is slated for release on Windows, Mac, and Linux in February 2014. Burst gave me some hands-on time with the Stone Wardens prototype at E3 2013. After a brief intro to the game's mechanics, I took control of the Ninja Warden, one of the game's four confirmed heroes. The game controls from a third-person perspective, with a free flowing, top-down camera perspective that tracks your warden like in League of Legends. Right-clicks send your familiar off to do tasks, while left clicking moves you around the map. Each warden can unlock new abilities and upgrades for existing powers, activated with hot keys. Even playing solo, your warden isn't alone. Players are accompanied by magical pets called Familiars that are used to summon and power the towers, dubbed Ancestral Guardians. The map I'm playing has various summon points for these guardians along a path, where I can place the statues and then command my familiar to power by collecting spirit at the level's various spirit wells. The spirit is key: I can't power the game's guardians without it. Once powered, the statues come to life and attack enemy units as they amble through the level. Each guardian has specific attack patterns and uses. Archer guardians are cat-men that attack with rapid-fire arrow volleys, while Valkyrie guardians use powerful beams of energy that extend beyond the original target. Rock Giant guardians toss huge boulders, sending out rock shards that deal secondary damage. Fire Dragon guardians have a shorter range, blasting fire that can set multiple enemies ablaze, while Gargoyle guardians shoot beams of light that increase in damage the longer he has a target in his sights. Each has a set of animations as they pummel the invaders, and while still in prototype stage, the vision for the animation style comes though. In all, Stone Wardens will feature 11 of these ancient guardians, plus four that are specific to each of the game's wardens. Bowman tells me that the different guardian attacks will also trigger different states for the invaders, leading to potential “combo” attacks when playing multiplayer matches. The invaders themselves ignore the damage-dealing guardians, rushing ahead toward the portal you're defending or, as happened to me, dealing damage to wardens themselves. At one point, a colossal cyclops launches me across the map with a swing of his club. Wardens will be able to attack invaders with powers, like the Ninja's area-of-effect fire attack, alongside dealing damage through guardians. Setting towers in strategic positions, I send my familiar off to collect more spirit while picking off invaders from the sides. The difficulty on the prototype map is set to low, but I can still get a sense of how much fun 4-player co-op can be. When my last Gargoyle fries the final batch of invaders, the demo ends. In the final game, Bowman says, players will earn experience, gold and the chance at enchanted equipment once a map is completed. Experience leads to leveling, granting points used for granting new abilities, upgrading existing abilities, and customizing stats. Gold can be spent on new equipment and inventory between levels, while a lottery-like system will give players access to enchanted, top-tier loot depending on the challenge level of the map. If executed properly, I can see how the system will feel like random boss drops in World of Warcraft or Diablo 3. For more info, check out the Stone Wardens project page at Kickstarter, which includes the project's backer tiers, gameplay videos, and more.